For the first time in a long time I had time yesterday to just play. Not to have to worry about deadlines or themes or anything else. JUST PLAY... and I am so HAPPY about that. 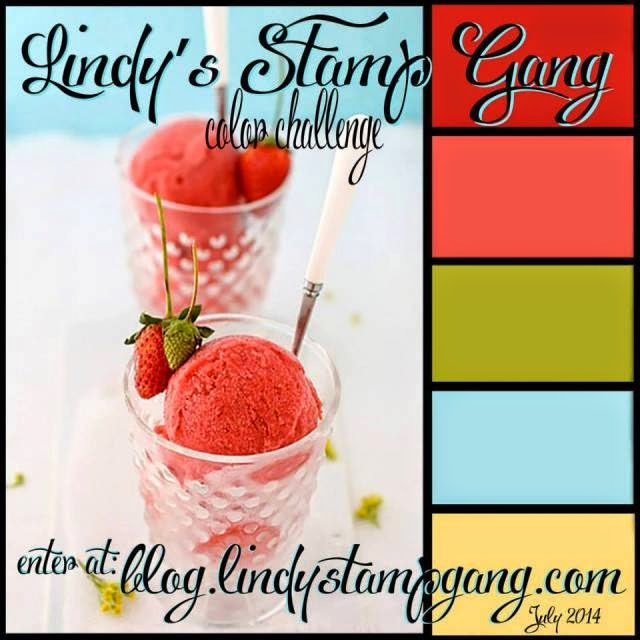 Lindy's Stamp Gang have this fab colour challenge at the moment and the colours are just gorgeous, and so I decided to play along. Really summery and fun colours. I have had the Moonshadow mists for a while and really really struggled to use them :( Then I got hold of a few Starburst colours and some Flat Fabios and I really wanted to just play with them, and I love them now. Dance like no one's watching, sing like no one's listening. Love like you never be hurt, play like there's no winners, behave like mum's watching. Give like you have plenty and SMILE!. Now lots of you know all the struggles I have had of late with DT's, time management and insecurities over my layouts and so on. I have always struggled with the whole mixed media thing too, I love the look of it but I don't like the mess that comes with it. I think I am an OCD neat freak who does not like mess or getting dirty. So I looked on the internet and watched more than a few videos, tutorials and even did a couple of online classes to see if I could break free. I did - well sort of - I went through a packet of wet wipes :) but I did it. This is the first layout in a long time that I have done just because I wanted to. No limits, no constraints - just play time and I have to say it is so freeing. I want to learn to use the products that I have bought and never used because I have always been afraid of making a mess. I did this layout twice because I didn't like the first background and there was no stress - I just said fine... let's do it again. I look at the ease which other scrappers slap on gesso, mists, stamps and papers and there is no rhyme or reason for how they do it and the end results are breathtaking. For me - I want to know exactly where to put what, measure the distances and control the pools of mists and when I do the end results for me always look stiff and rigid, like something is missing. It may be a slow process but I am ok with baby steps and I am looking forward to this long walk to freedom. I will get there in the end. I started off by covering a piece of white card with papers from a dictionary... some with just text and some with pictures. Then I covered the whole thing with a layer of gesso allowing the text to show through. I added the mists in Tiffany's Blue and Magical Mai Tai and the olive is Distress Ink as I didn't have the right colour green in a mist. The quote was stamped in black archival ink, and I made boxes around some of the words. I also stamped the butterflies in black and then added some clear lace tape as well as some builders tape - It is a pity that the clear tape does not show up so well. I made some splatters with the turquoise and some black ink. The large circle is hand stitched and the others are stamped and the title is some old stickers I had in my stash. Here you can see the stamped and stitched circles. I then added the flowers and die cut leaves. Thanks for stopping by to take a look and for taking the time to leave a comment. Absolutely breathtaking! The best way to learn mixed media is to play, and it seems to me like you have climbed a few steps in the mixed media process with this layout. Your design is superb (nothing haphazard - beautifully balanced, yet free and definitely not stiff and rigid) and your background is stunning. Thank you for the inspiration. Val!!! It is fantastic LO!!! Love all colors and accents!!! Enjoy the journey into the messy side of life... it is liberating! I'm happy you are still persisting to get the mixed media under the knee...and there is nothing wrong with doing it the neat and measured way!!! Keep up the good work...always loving your pages! 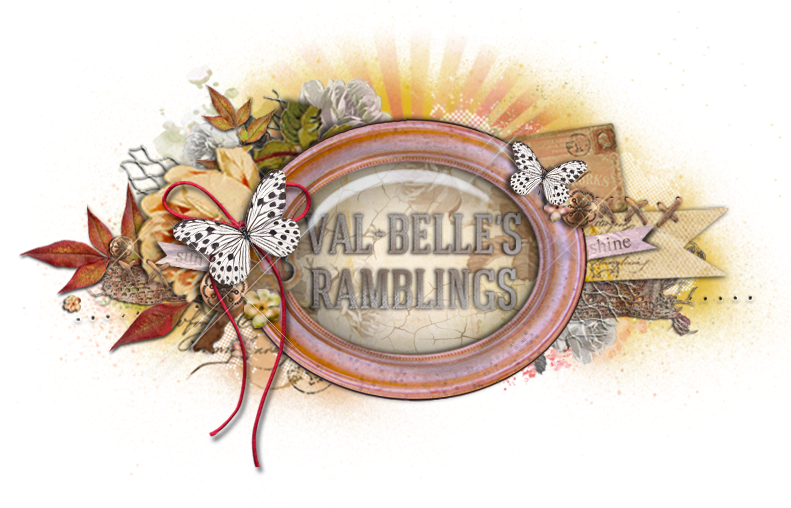 Love those soft muted colors in you background, Val! I somehow feel "comfort" in them! Yet, when you reintroduce those same colors in your vivid floral elements, I am not disturbed, but energized. That's a pretty cool accomplishment, my friend! On reading your journaling, I found myself agreeing with an affirmative head nod, a couple of "Uh, huh's," and one audible "EXACTLY!" Since I have thrown away (figuratively, of course) all my rulers, I have become a must better scrapbooker and art journaler, and must add that I enjoy the processes much more. Love your photo, Val! You are a beautiful person! This is gorgeous, Val! Well done for you for giving it a try again and for being so brave to go out of your comfort zone. There's something so great about letting the inner child inside you play, and the resulsts are simply gorgeous. love it. I am totally behind you here. I am also scared of getting my hands dirty and my layouts messy. I love that you had time to play and I love love love the result. It is gorgeous. You know...I think maybe we see our own work differently to how other people see it. I think this is spectacular & doesn't look measured, planned, stiff & rigid...AT ALL! You've done an amazing job, and you really need to give yourself more credit & have more confidence in your work!! Seriously...your work is always so so inspiring & I love it <3.